Albany, NY – August 27, 2015, Blasch Precision Ceramics, Inc., an Albany-based ceramic technology manufacturer, is proud to donate to Ronald McDonald House charities nationwide. What began as a cost savings measure quickly turned into charitable giving for children and families in need. To alleviate exorbitant rental charges during industry conferences and tradeshows, Blasch Precision Ceramics’ Director of Marketing proposed purchasing, instead of renting, HDTVs for use at each conference – at a fraction of the rental cost. 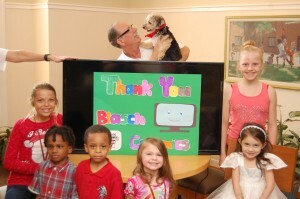 To take the idea one step further, instead of shipping fragile TVs around the country after these tradeshows, Blasch personnel at each conference coordinate the donation of the conference TV with the closest Ronald McDonald House. At the close of each show, the local Ronald McDonald House becomes a recipient of a just-like-new, 46” RCA 1080p 60Hz LED HDTV with ROKU Streaming for the kids and family members to enjoy. Blasch plans to continue this initiative through the remainder of the 2015 tradeshow and beyond.